Black and white negative of Gerald looking out from under a sheet. 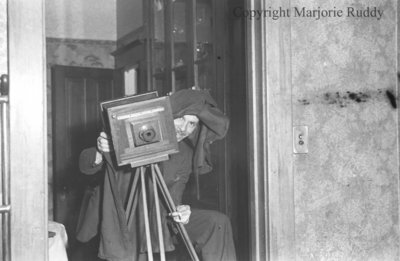 He is kneeling behind a large camera in an inside doorway. The negative envelope does not provide a last name for Gerald or the date or place the photograph was taken. Gerald and camera, c.1939, Marjorie Ruddy. Whitby Archives A2013_040_812D.